I was fortunate enough to spend 12 days with 24 crazy people as part of the 2014 Unogwaja Challenge support team. My role was social media, communications and general awesomeness. Throughout the time I was also in charge of the daily newsletters and this is an extract of some of my mutterings during the challenge. We are gifted with 24 hours in each and every day. Many of us use these hours to complete the mundane and the ordinary. But on this 24 hours a group of 25 individuals (12 Unogwaja & 13 Support Crew) dared to make a difference and leap into the unknown. The unknown before them was the Unogwaja Challenge 2014. 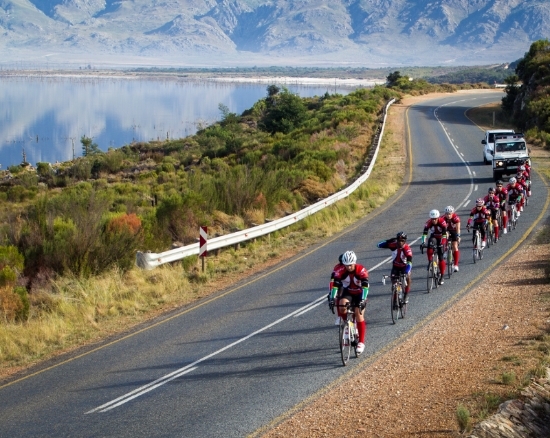 Outside the Tsogo Sun, Southern Sun Waterfront, the Unogwaja’s were joined by approximately 60 full-hearted cyclists to cycle the first part of leg one from Cape Town to Franschhoek. Before the cyclists set off, there were messages of heart from Jeff Rosenberg, John Mcinroy, the Stoff and Elana Mayer. Elana showed how she was truly inspired by the Unogwaja Challenge and left other people with a challenge to change the world. She also left the exciting thought that one day, when she grows up, she wants to be an Unogwaja. Today was a day that changed me. I learnt today that in life your circumstances do not define you, but rather the way you respond to it will be the measure of your heart. Danielle Mascher, who has overcome her own personal challenges, faced a challenge of massive proportions. When given the choice, she chose fight, not flight. Amongst all signs pointing to failure, she had the courage to believe and the heart to achieve. The team rallied around her in the most difficult situation and lifted her to new heights. It was an emotional day which proved how the heart can overcame any challenge. It was a memorable moment that I am grateful I can share. A select few Unogwajas had the opportunity to interact with the Union High School students and members of the public. Here was the lasting thought from each one of the 6 that spoke. Rene – “Do what you can, where you are, with what you have? When given the chance to change the world..
How many of us deny this and prefer to perform the mundane, trivial activities that just tick the box? How many of us prefer to avoid moments of greatness rather to perform moments of sadness? When given an opportunity for misery, how many of us pick wallow rather than swallow. How many of us refuse to change the World, even though we have been given the opportunity to do so? 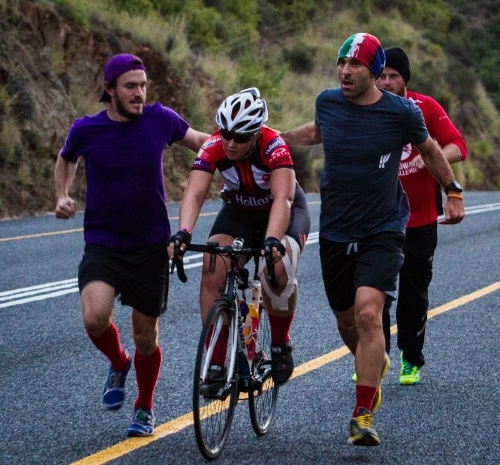 The Unogwaja Challenge were given the opportunity to change the world and embraced it. As they travel across South Africa, they are touching the hearts and lives of many people. The team were dealt with a serious blow when Florian came off his bike. The mental fortitude needed to overcome this was exceptional and exceptional was delivered. 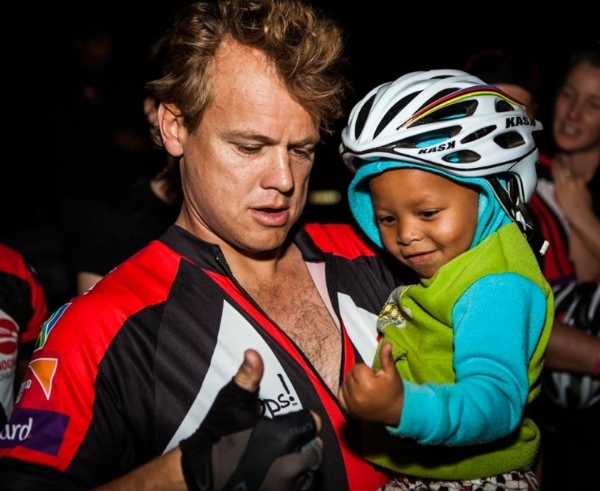 When given an opportunity to change the world, the Unogwaja team chose to ride on and touch more lives. To ride on and inspire more dreams. To ride on with heart. I have learnt in my week with the Unogwaja team that each one of the 25 members of this team are all following their dreams through the following of their hearts. That their paths are all aligned is what brings the story together so much more. When Walt Disney said “If you can dream it, you can do it” he never would have expected the lengths and breadths that his message would travel. Today there are thousands of people following their dreams and following their hearts. The likes of Ron Rutland, Riaan Manser, Ray Chaplin and of course John McInroy were all dreamers who refused to let their dreams be just dreams but rather reality. The 29 May was the 8th Day of the 2014 Unogwaja Challenge, but almost more interestingly it marked exactly 61 years since Sir Edmund Hillary scaled Mount Everest. Sir Edmund Hillary was a dreamer who wished to summit the Worlds highest peak. There were so many reasons why he shouldn’t have done it, there were many reasons why he would not succeed, but he went with heart. 61 years later and we can tell a tale of adventure that became part of the iconic history of the mountain. The reason we can tell this story is because Hillary had a dream and made it a reality. The difference between the two is action. I read a post recommended for me on Linkedin the other day, it was almost as if someone was giving me a push, it was 11 reasons why you should follow your dreams. One of the reasons was that you could inspire other people. I would like to challenge that assertion. I honestly believe, through my experience on this years Unogwaja Challenge, that if you follow your dreams, maybe you will inspire others, but more poignantly is that you will yourself be inspired. Everywhere I have traveled in this challenge, every town, every city, every person have made an impact on my life. I knew from the second I heard the story of the Unogwaja Challenge that I had to be involved. I needed to live the story. It became a dream of mine. I also knew that cycling and running the challenge were things that I wasn’t going to do. Instead of using it as an excuse I found ways to make my dreams work. In the Unogwaja Challenge this year I have given high fives, hugged strangers, danced with local people, waved flags, filled water bottles, fetched food for cyclists and driven a van. My role was to do the social media and the newsletter. These other tasks may seem like distractions to my role and to my dream. I believe they are just rungs of the ladder that help me reach the destination to follow my heart and fulfill my dream. Today as you sit behind your computer and cast your mind towards your dreams. Have you started doing them yet? Have you started following your heart? Remember if you don’t make your dreams a reality, someone else will get you to help them build theirs! There were moments of tremendous heart. Moments of tremendous joy. Moments of tremendous love. The 2014 Comrades Marathon would also deliver the single greatest individual demonstration of team above self and heart that I have ever been fortunate to witness. And it was Ritas’ self sacrifice that led to Tiago Dionisio teaching me another lesson. He taught me the lesson of love. He taught me that there is no joy in winning when you win it alone. He taught me that in life you pick others up before your pick yourself. In an 89km race, he turned around to help his lady Rita. Rita was unfortunately unable to continue and he only managed to finish with 20 seconds remaining. There was no joy in a narrow victory but disappointment in not being able to take his team-mate to the victory as well. In life the relationships we have are more important than the results we seek. Today I was reminded of this. Tiago is a hero to me and am honoured to be able to call him a friend! This is not the last that I will talk of the Unogwaja Challenge, it is just a way I could summarise things. My mind is tired and my Unowaja Challenge is over, but my heart is full and my journey of heart has just begun!